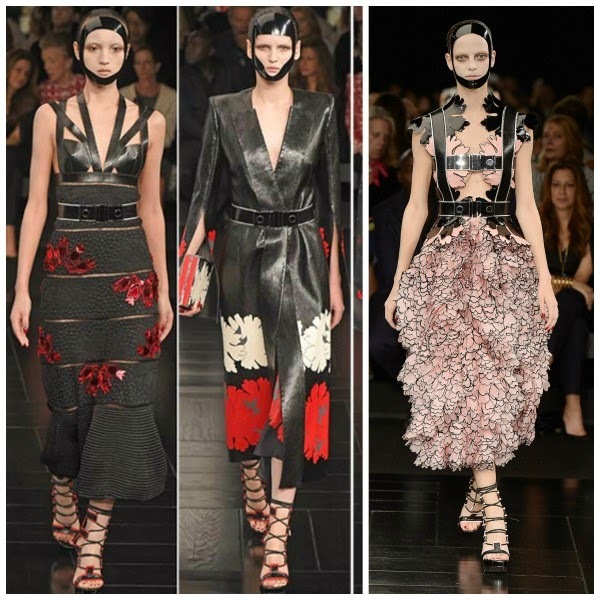 Melding futurism and classicism into one, Redken Creative Consultant Guido created a Japanese-inspired look for Alexander McQueen’sSpring/Summer 2015 show in Paris. “With McQueen, it is always about the yin and the yang – the push and the pull. The hair here is reminiscent of the hair in Japanese sumo, a bold Asian-inspired style that, when paired with the mask, becomes very futuristic. When working with Sarah [Burton], there’s always this combination of avant-garde and classicism that she ignites. I wanted the hair to feel almost traditional, but the wet hair look allowed it to become more modern – it is a balance of the two. The hair is saturated with hardwear 16 super strong hair gel which is combed through. The goal was to have the hair flattened so it creates this shape so I used a card to help fold the hair like pastry and pin it up, keeping it in place with forceful 23 super strength finishing spray,” Guido. Start with dry hair. Saturate hair section by section with hardwear 16 super strong hair gel. Comb hair straight back with a fine-tooth comb. Gather hair and roll from the bottom up into a rectangular shape. Pin hair into place. Finish with forceful 23 super strength finishing spray to hold hair in place. Redken products can only be guaranteed authentic when purchased from a salon. To locate a Redken salon, please visit Redken.